The instructive and empowering history of New York’s nationally significant historic preservation movement is on the verge of being lost. The mission of the New York Preservation Archive Project is to protect the endangered stories of historic preservation in New York. Ignorance of the history of the battles can be as dangerous to the structures as a wrecking ball. Through public programs, outreach, celebration, and the creation of public access to information, the Project hopes to bring these stories to light and to the public. What is specifically needed is an acknowledgment and movement toward greater awareness of the grassroots groups and efforts of individuals that went into both successful and failed preservation campaigns. It is critical that today’s preservationists, both lay and professional, see themselves as part of a continuum, that changes have been made, that fighting for a worthwhile cause yields results. The lessons of history offer proof of this and thereby protect the future. As we draw towards the fortieth anniversary of the beginning of the demolition of Penn Station on October 28, 2003, we are presented with a classic example of just such a crusade. 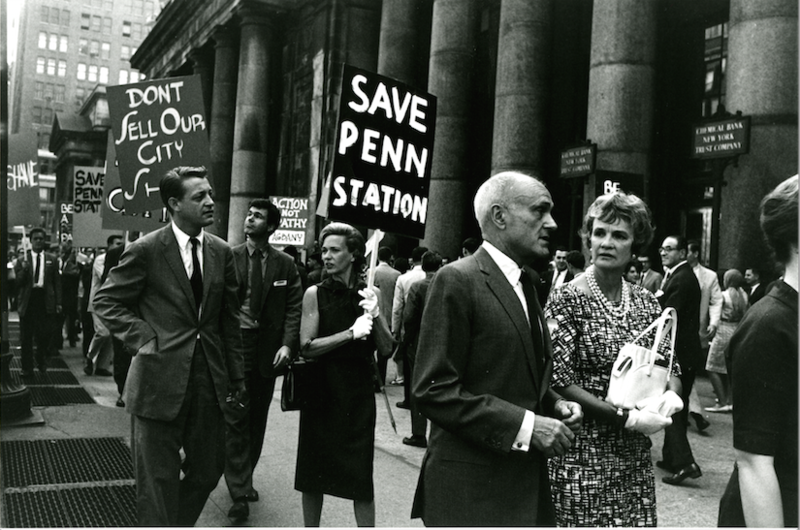 So significant were the efforts to efforts to save Penn Station, and so mythic an event was the failure to do so, that although the building was obliterated, many link the protests with the creation of New York’s Landmark Law. That act of destruction, captured in headlines and editorials, has had repercussions still felt today. It was truly a landmark occurrence in the history of preservation. Its anniversary is both a “teachable moment” to underscore the continuing importance of preservation in our city and perhaps, because of the growing span of years, a final opportunity to capture the memories of those involved in this watershed event. To both commemorate and better document the loss of Pennsylvania Station, the Archive Project hosted “Remembering Pennsylvania Station.” The event began with a series of readings related to the Station (ranging from Thomas Wolfe, to New York Times editorials, to testimony from city hearings). A roll call of “veterans” (those involved in the efforts to save the station) was followed by a reception saluting them. During the reception, two video stations recorded the memories of these “veterans.” These mini-oral histories went into the Archive’s collection, become a cable TV program, and formed the basis of subsequent research and interviews with key individuals. Preliminary research has identified almost 300 people involved in some way in the efforts to save the Station. Whether, like Richard Kaplan and Ray Rubinow, they were part of the famous picket line around the station, or like Lewis Mumford and Langston Hughes they sent testimony, or like Norval White and Peter Samton they were members of the Action Group for Better Architecture in New York, they all played a role. Now some 40 years later, many of these individuals are gone but a surprising number are still with us.